I have learned that your can cook your way to health. One of the most common allergen is to wheat and by learning how to remove wheat and gluten from your diet not only will you feel better, you will over time notice how slim you will become. Baking from scratch is one thing I didn’t think I would be doing however due to a life changing even last year my husband became allergic to everything except buckwheat and coconut flour. Now you may ask what in the world can you bake with those two ingredients that would taste good? I felt that way too and my kitchen became one big experiment. Here is a photo of the first baking effort I made! Please note this was a half day event since I had not baked from scratch for quite a while. And on another note your will learn that gluten is the element that holds your baked goods together! So with that said these tasted different than any bread I had ever eaten and they did not rise like most muffins. 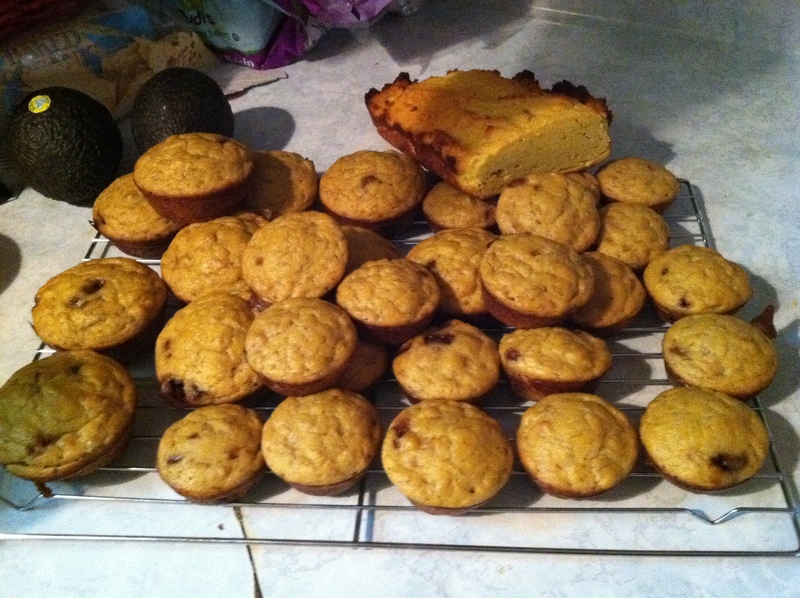 Can you see the heavy looking loaf of bread in the back of the muffin stack? It hardly rose at all. Coconut flour is very dense and super absorbent. It requires lots and lots of liquid. So there is a learning curve with using new gluten-free flours and I have come to the realization that baking is moody, it will rise if it wants to and will often surprise you with pure amazingness. Cooking is like most women I know! Even that flat loaf looks delicious! That bread was very good, however my baking has improved tremendously since last year. Once you figure out how to balance the weight of the different flours with other ingredients the outcome is lighter which helps with taste and texture.